The first to come up the stage on The Voice Philippines on November 15, 2014 episode is Ramonne Rodriguez. 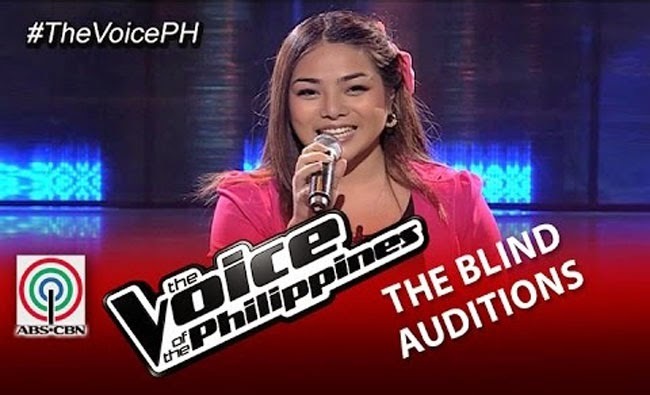 She was tricked by The Voice Philippines into auditioning in some sort of other talent search with weird ways and she had no idea that in the end she will be given the invitation for the Blinds Audition. She wanted to inspire people with her talent, making her more determined to be The Voice. Wala Na Bang Pag-ibig is her chosen song to capture the attention of the four coaches. As she hits the chorus, the coaches were still listening intently, which might have scared her a little and soon Bamboo turned for her. Bamboo then voiced out that he liked what saw as he turned. She shared that she was a frustrated dancer and she does many things such as singing and dancing to earn money. Apl de Apsaid that Bamboo seemed to be able to be an alien because he was able to know pretty artists even before seeing them. Sarah said that Ramonne can still hone her talents and Bamboo promised to do that as he had heard some uniqueness in her voice. Happy being in Bamboo’s camp, the20 year old artist could not hide her excitement that she finally has a chance to reach her dream.